29-Dec-2003 -- The people who took part in the expedition are either students at the Agricultural University of Norway, (NLH) or the brother of one; Ole Edvard Silderen – local guide and student at NLH (forestry). Arne Bakken – brother of Knut and gardening expert. Birgitte Schjøtt – person from the southern part of Norway and student at NLH (economics). Knut Bakken – brother of Arne and student at NLH (building technology) Ingunn Skei - Expert of geomatics and student at NLH (geomatics). We had discovered that this point wasn’t visited yet, and we couldn’t believe that this point could be so difficult to reach during the winter. 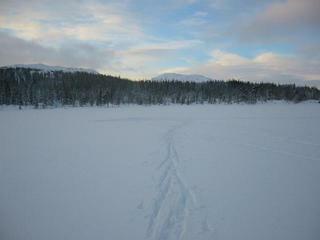 We were skiing, and we started from Nordlia, as suggested at the web-page. This route were also recommended by our local guide. This 5th Day of Christmas was clear and beautiful, but extremely cold. At the start we measured –14˚C, and at the exact point it was at least -20˚C. We walked for about 3 kilometers and had a nice, but cold trip to Åsavatnet. The track is relatively flat, and most of the route is marked as a natural wintertrack to the well-known top Follaheia. We were using a GPS of type Garmin Etrex. This type of GPS is supposed to have an accurancy of ± 5 meters. According to this GPS we were on the exact point. We located the point in the southwest part of the lake. We had a photosession and a celebration, and then we quickly returned home because of the cold temperatures. We then visited the home of our local guide outside the tiny village Sela on the moutainfarm Silderen Nedre. After lunch we said goodbye to our friend and local guide and returnd back home. In the lake Åsavatnet, about 120 m from land.